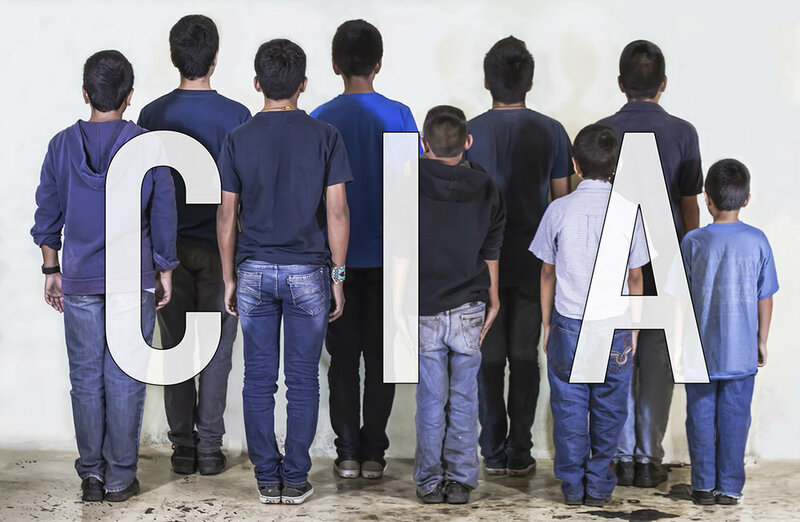 This year the Sur Biennial sees its 4th iteration and takes place at seven different venues across South and East Los Angeles; amongst them, Torrance Art Museum (TAM) and Rio Hondo College Art Gallery, each of the seven spaces joins a wondrous art celebration, each featuring a completely different Pacific Standard Time: LA/LA exhibition. As of now, I have happily witnessed The Cuban Matrix currently on view at TAM, and a few nights ago I attended the opening reception for Espacio Entre/Entre Espacio at Rio Hondo College Art Gallery. Cuban Matrix features artworks from various contemporary Cuban artist in a virtual Mercado that highlights cultural exchange, created under Cuba's limited conditions and access to digital resources. Also featured at TAM is a solo exhibition of Mexican artist Yoshua Okon. "Oracle" is a video installation by which the artist questions the relevance of contemporary nationalism. Must see! 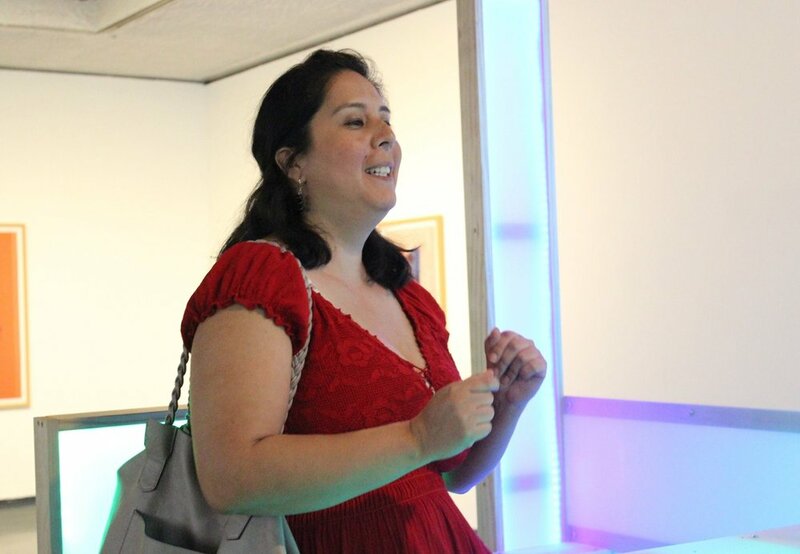 While TAM examines Cuba, Rio Hondo College Art Gallery challenges the traditional understanding of the spaces in which Latin American Culture and experiences exist. Featuring artworks by Luis G. Hernández, Margaret Griffith, Maria Rendón, Albert Lopez Jr., Ruben Millares, and Lino Martinez. While every single artist brought forth amazing works on paper, video, light installations, public outdoor banners, or metal sculptures without a doubt the highlight of the night was truly... a Taco! Artist Albert Lopez Jr. created a truly perplexing conceptual artwork entitled "Tacos a la microonda" (which roughly translates to Hip tacos at a micro scale). The immersive, engaging, action, installation, performance artwork (yes, I said perplexing) consisted of a platform enclosure that hosted both Lopez and his accompanying DJ friend (seen below). The wooden platform itself functions as a sculpture/installation in the round in the absence of Lopez, and constantly varies in color as it protrudes color-changing lights in a similar fashion to the James Turrell installations, however with faster transitions in between hues. Carefully crafted, inside the structure holds a functional microwave, a meat cutting station, a tortilla holder and compartments for condiments such as cilantro, onions, and salsa (because really, what is a taco without them? ), and a full blown DJ station. On an adjacent wall rest a light box that serves as a sign with the name of the artwork "Tacos a La microonda." During the opening reception, Lopez' DJ friend delighted the crowd with an endless playlist of Latin beats, I heard cumbias, salsa, and Latin remixes, the crowd danced as they waited in what seemed like an endless line to partake in this artwork, dozens of shoulders shimmying all over the gallery, including my own will not be denied while in line for a taco. Lopez activated his work by serving tacos from within the structure all night long. As the music played, Lopez danced and cut Carne Asada, that man has impeccable chopping rhythm, I must confess. I believe there's simply something buried deep within every Latinx I know that makes it almost impossible not to shake one's bonbon if La Sonora Dinamita starts playing; it must be the Latinx rhythm that lives deep within our blood I suppose (listening and typing now ♫ "escandalo, es un escandalo" ♫). So lets recap; there's a gallery, there's art, there are at least one hundred people dancing, there are tacos, and how does any of this make any art sense? 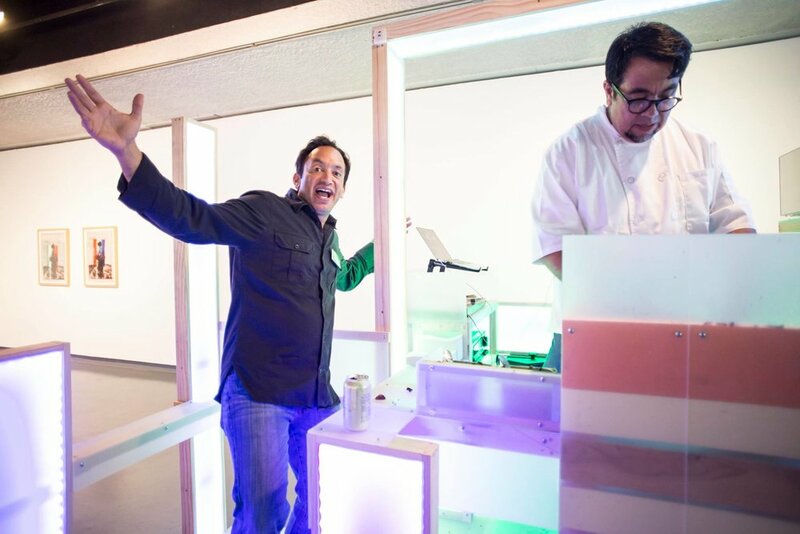 Well... obviously Albert Lopez Jr. created an epic installation/performance of Latinx Contemporary Conceptual Art that challenges the Latinx cannons by blatantly reinserting "Tacos a La Microonda" into the normative narrative of life within the United States, in what he has cordially deemed "Culture Cannibalism." In a recent conversation with Lopez himself, we discussed how in the predominant narrative of Latinx culture within the U.S. there is little room for the authenticity of our mother cultures, take Mexican food for instance. Mexican cuisine in the U.S. is infused onto our daily diets in iterations such as Del Taco, Taco Bell, Chipotle or Baja Fresh (each of which lacks a healthy resemblance to actual Mexican food). Whereas the counter culinary narrative in this particular instance could be considered the emergence of food trucks (also not a predominant Mexican staple), we must turn our gaze more so to the hidden street vendors that emerge for a few hours here and there across this City of Angeles after dark, if we seek an authentic taco that is. But what does this mean for Latinx in the U.S.? How are we cannibalizing our own culture? Are we partaking in Cultural Cannibalism and if so do we need to stop? What does this mean for the future of our reality in this country? For the future generations to come? For me and you today?That taco packed a punch, it raised so many questions. A single taco, a single song, a single celebration of culture at Rio Hondo College art gallery, many-many happy people dancing, engaging, questioning, all because of a taco... even though I actually had two, they were delicious! I had a great time dancing and eating tacos at Espacio Entre/Entre Espacio, while genuinely witnessing students indulging in an art experience that allowed them to celebrate their individual cultures while challenging my own understanding of Latinx spaces and experiences in this my new home (the United States). A single taco was truly a celebration of culture, that plus dancing to La Sonora Dinamita while in line, reminded me of being home; home in my mother country (Mexico) where the real tacos are made, home at my mom's house where the best salsas are born, home in every iteration of a word which for me personally is constant flux, home somewhere in my own nepantla. Thank You, Mr. Lopez, for some amazing Tacos! I am very much looking forward to the rest of the locations at the Sur Biennial, and hopefully will come across "Tacos a La microonda" again real soon. 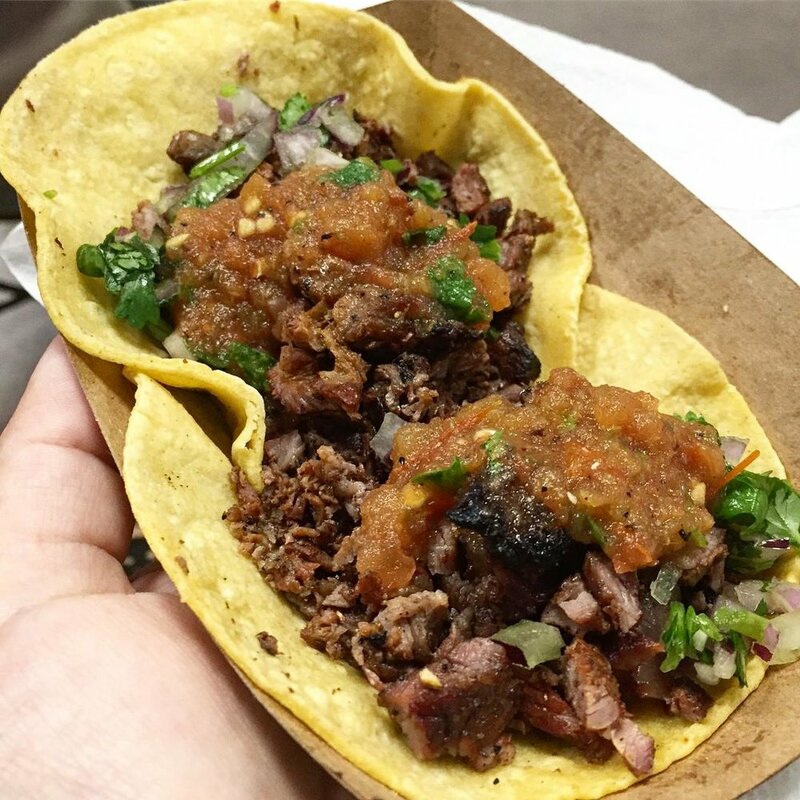 Follow Tacos a La microonda on IG. Photographs courtesy of Rio Hondo Arts and Cultural Events & Albert Lopez.